Antonio Banderas is hot on the trail of a woman he spent the night with in the latest commercial for his Power of Seduction fragrance. 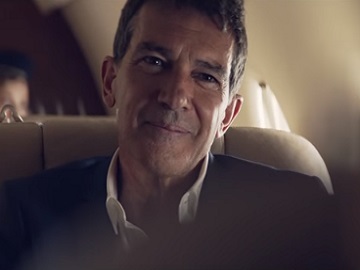 The suspensful ad, which seems a scene from an action-packed movie, opens with Banderas waking up in a hotel room and realizing that the woman he had spent the night with downloaded a file from his computer and left. Getting on the balcony and seeing her ready to hit the road on a motorcycle, he rushes out in his underwear to catch her. Along the way, he has all kinds of ideas to procure clothes and the means to pursue her up to the plane she gets on. Finally, it turns out he only wanted to give her an earring she had forgotten in the hotel room. Power of Seduction for men features top notes of Bergamot and Apple, heart notes of Lavender and Clary sage, and base notes of Oriental woods, Amber and Moss. Released earlier this year, it is being marketed by Puig. Since he launched his first fragrance with Puig, in 1997, Antonio Banderas has grown his portfolio with fragrances for both men and women, like King of Seduction and King of Seduction Absolute, Queen of Seduction, The Secret, Her Secret, The Golden Secret, and Her Golden Secret.